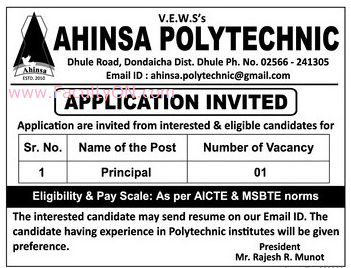 Ahinsa Polytechnic, Dhule has advertised in the LOKMAT newspaper for recruitment of Teaching Faculty- Principal jobs vacancies. Interested and eligible job aspirants are requested to apply immediately from 03rd October 2018. Check out further more details below. About College: Established in year 2010 by Vardhaman Education and Welfare Society and approved by All India Council for Technical Education, Maharashtra State Board of Technical Education and Directorate of Technical Education Mumbai, we are a fast growing, Technology passioned and quality technical education focused Polytechnic Institute from Dondaicha in Dhule district of Maharashtra State in India. As per AICTE / MSBTE norms. Candidates having experience in Polytechnic institutes will be given preference. How to Apply: Interested and eligible candidates are requested to send application along with CV, copies of certificates, PAN card, Aadhaar card and recent passport size photos to the email address given below.